McCarthy Met With Steve King About His Future in Congress. Here Was the Result. GOP Leader Kevin McCarthy had a "serious conversation" with Rep. Steve King (R-IA) on Monday evening regarding his (latest) controversial comment. Last week, in an interview with The New York Times, King asked the editors when the terms "white supremacist" and "white nationalist" suddenly "became offensive." Republican lawmakers immediately distanced themselves from King and his remarks. Sen. Tim Scott (R-SC) wrote an op-ed condemning the rhetoric, while former Gov. Jeb Bush said enough was enough - the party should support whoever wants to primary King and get him out of Congress. Following King's meeting with McCarthy, it's clear they are not going to go that far in terms of a punishment. The leader told the press that at the very least, however, the House Republican Steering Committee agreed to bar King from all House committees in the 116th Congress. 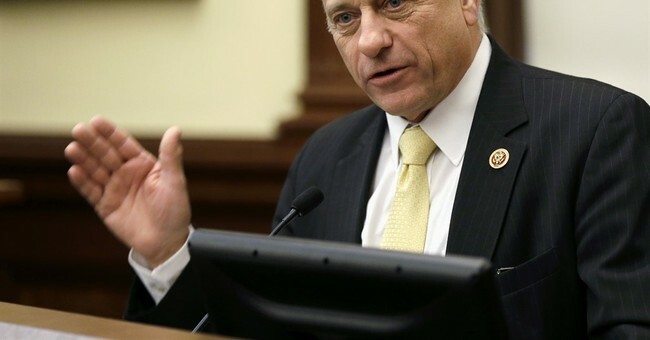 In a statement of his own, Rep. King said, "Leader McCarthy’s decision to remove me from committees is a political decision that ignores the truth." He insists his words were taken out of context.